Lame sitcom The Millers was a complete waste of Will Arnett—thankfully, CBS has canceled it so he can concentrate on a second season of Bojack Horseman. 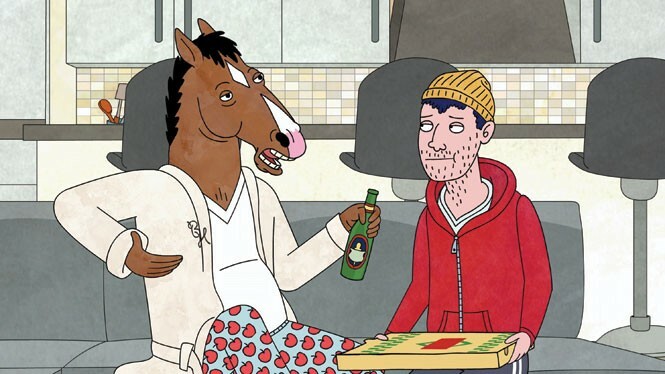 The first dropped in August, 12 animated episodes about irrelevant TV star Bojack Horseman (a man-horse voiced by Arnett) who was never able to follow-up his craptastic (but still better than The Millers) hit '90s comedy, Horsin' Around. Now, he spends his days and nights boozing, whoring, lapping up what little recognition he still receives and attempting to write a comeback biography, with little help from his freeloading mansion roommate Todd (Breaking Bad's Aaron Paul). Like Californication remade for Adult Swim, Bojack Horseman is a sick-and-wrong slap at Hollywood, but with the random sweet, poignant aside ... which inevitably turns sicker and wrong-er. The 10-episode Transparent has been—rightfully so—talked up as a vehicle for TV vet Jeffrey Tambor's out-of-the-park performance as retired professor Mort, who's finally let it be known to his family that he's transgender and has always identified as Maura (good call not going with Morticia). But Transparent's killer ensemble (which includes Judith Light, Rob Huebel, Gaby Hoffmann, Jay Duplass, Carrie Brownstein and many more familiar faces) is the show, like a less-whiney Parenthood shot through an LGBT prism. Gather the family 'round after Thanksgiving dinner ... well, maybe not all of them. Only a single pilot episode (which was up-voted to a full series for 2015 by Amazon Prime viewers—welcome to the future) is available at the moment, but it's a promising hour: Ron Perlman (late of Sons of Anarchy) stars as a hard-living, morally gray judge who suffers a mental breakdown and suddenly believes God (who talks to him through his comatose son) wants him to become a vigilante for a higher law. Along for the ride are Dana Delany (as his skeptical wife) and Garret Dillahunt (as a sketchy, Jesus-y criminal the judge enlists to help dispense his "righteous" justice). And yet he's still more sympathetic than Sons of Anarchy's Clay Morrow. Grammatically off but otherwise very British, the six-episode The Wrong Mans follows a pair of everyday, none-too-bright city workers (Mathew Baynton and James Corden, both of Brit comedy Gavin & Stacey, the latter being next year's Late Late Show replacement for Craig Ferguson) who inadvertently become embroiled in an intricate, dangerous conspiracy that escalates by the minute—it's 24 and Homeland meets The Office and Parks & Recreation, with the dramatic and comedic sides played up equally. Not to sound like That Guy, but Americans can rarely pull this mix off (though The Wrong Mans was partially inspired by the Coen Brothers' Burn After Reading). The first two seasons that originally aired on A&E (Assclowns & Evildoers) are available now; Season 3 will follow eventually; Netflix has rescued Longmire from A&E's recent cancellation by agreeing to produce a fourth. So catch up, already.